The Brighton Festival launched it's 2009 program last Friday and shows are already selling out. Hydrocrackers exciting production of The Erpingham Camp by Joe Orton on the pier sold out in a day! 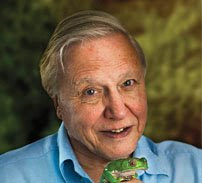 However there are still tickets available for Sir David Attenborough in conversation which will undoubtedly be fascinating and inspiring - get them quick. Fancy being the next leading natural history filmmaker? Why not check out our summer project in Bolivia to gain your own hands on experience in animal welfare.